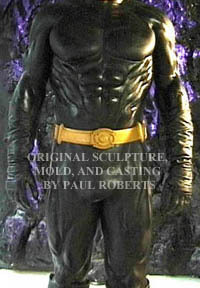 My Original Full Generic Multi Superhero Latex Coated Urethane Foam Muscle Suit. Be Any Superhero Today!!! NO ASSEMBLY REQUIRED!!! Just customize and slip into this full suit. May Allow Some Restricted Freedom Of Movement. (Especially In Reinforced Perfect Suits) Your results may vary. Somewhat Flexible Not Tough But Looks Great. Photo Op Time. 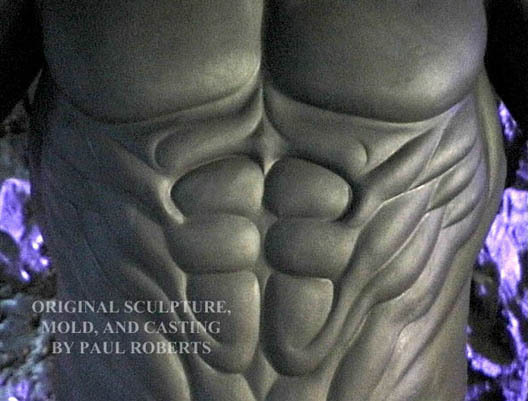 Now Available In Heavy Duty Latex Flat Finish Which Can Be Shined To Glossier Look with Plastidip and/ Or Armorall. Some duress does occur upon form removal. This suit is a trademarked original item and no reproduction in part or in totality is authorized. 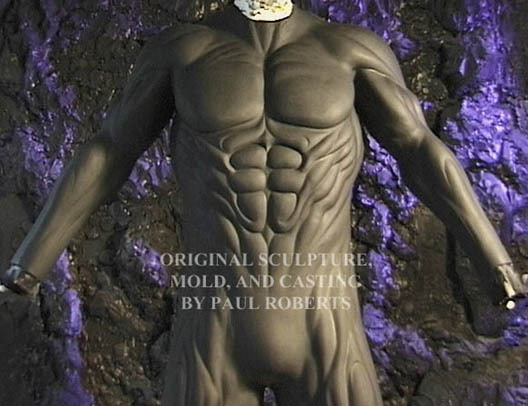 I have created the first in the world, Original Full Generic Multi Superhero Heavy Duty Latex Coated Urethane Foam Muscle Suit. 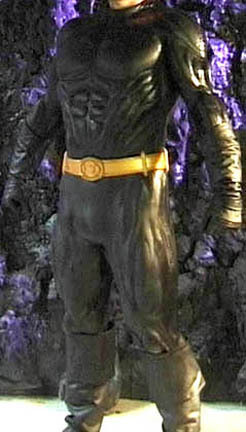 This suit can be customized to fit the majority of normal sized people from height 5'10" to 6'4" that have a reasonable build from 170- 220 pounds. Some cutting and trimming and gluing back together will obviously be necessary if your torso is much smaller then mine or larger or if a more exact fit is desired. The arms and legs are simple to trim shorter but some basic craft experience will be necessary to split the torso and take inches out and re-glue to a re-enforcement strip which is recommended. 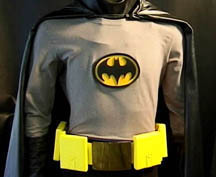 The seem will be visible and should be hidden under a utility belt which most heros use. 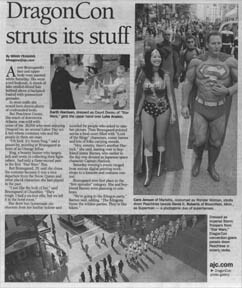 Note that about 75% of superheros have the same approximate muscular and body build. 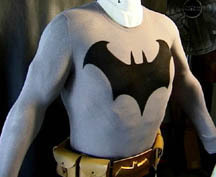 Now you can go out in public with that same build painted and adorned with all the gadgets, goodies, and symbols that each individual superhero who fits this necessary body shape would have. SPECIFICATIONS: This suit is made of urethane 3.0 pound cold foam which is melded into the high quality thick heavy duty latex rubber finish that gives outside strength while sealing and providing longevity to the foam beneath. 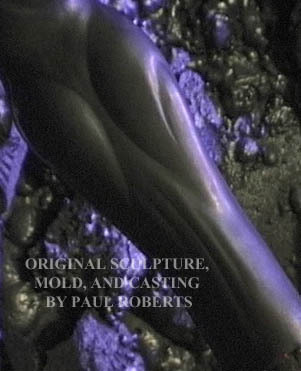 The interior is completely supported by a durable, heavy body stocking sub frame which is integrated into the foam as it is cast. 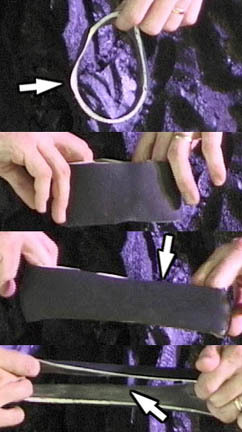 This makes the piece more difficult to rip during normal wear and use but also makes it stiffer and hold its shape. Walking and general wearing is somewhat secure but the length of time and use is unknown and will depend on hardness of use and the piece's integrity itself. I do not recommend doing superhero things or excessive bending or other stressful tasks. Bending it to get it off the form after it is out of the mold and bending in transit is enough. Think Photo Op suit. Note: Less stiffness can be achieved by not using the body stocking but then the seams become weaker and I would only recommend this approach on the more expensive perfect suits which the seams have been strengthend by additional coats of outer latex for strength. The back closure method is currently up to the wearer to decide on and implement. I recommend trying hand sewing a zipper to the thick latex, using velcro or the easy way punching holes and tying with elastic appropriately colored string if your hero wears a cape that will hide it. It is possible to just leave the back open under the cape. There is a seam on the side that goes all the way around and a small rough area under the back of the left arm pit where the foam is poured. The foam underneath is not completely perfect due to air bubbles that get trapped during the foaming process. Buyer acknowledges this. In order to make this suit affordable I had to make each one of an acceptable quality so it would not take several tries for each one. To do this they are coated in a heavy duty thick layer of latex designed to cover over most imperfections so they will be hidden underneath. I am not a department store and these suits are not mass produced on an assembly line. Each suit is hand made by me and may have subtle imperfections as stated. For all intents and purposes though it will look awesome and really make you look like the hero you deserve to be..
At this time there is no guarantee against defects or user damage and no returns or exchanges. DISCLAIMERS: I can not verify that long term use of this suit is healthy either in the body's tolerance of the heat build up on warm days or the exposure to the chemically created foam against the skin. I recommend use only with protective undergarments and make no warranties other than I assume the same risks myself and deem it acceptable for myself. Wearer will use at own risk. I personally wear a full rubber suit and cool vest underneath. This suit in no way provides bullet protection or protection against other hazards and dangers. It will also not provide the strength associated with the size of the muscular physique of a superhero such as it makes one looks and feel. Common sense is required in the use of this unusual item. It is intended for costume parties and appearances at calm social events in cold environments for brief periods of time while using protective undergarments only. 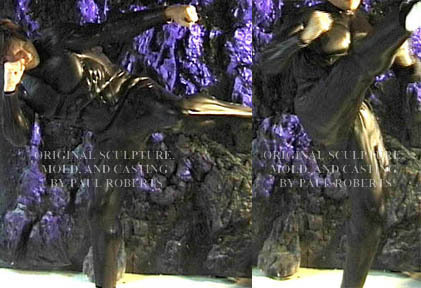 It is not intended for martial arts demonstrations or fighting of any kind. These suits are very hot and I recommend that they only be worn for brief periods or in cold environments. Think of it as a Photo Op Suit. That is what it is intended for. 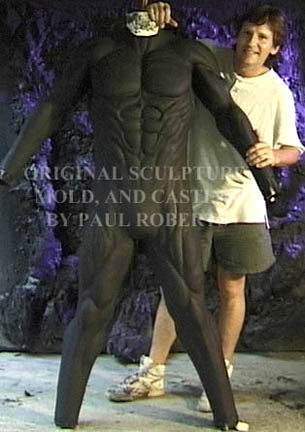 Some duress may fatigue the suit in the process of removing it from the body form. This adds to imperfectness of the imperfect ones. 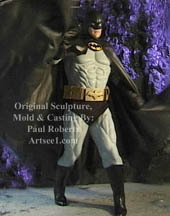 3,500.00 Near Perfect (Seam is painted and whole suit is repainted and so no major defects can be seen. These suits can also be made more flexible by having the under body stocking removed if it is so desired.) Perfect suits are slightly more durable. 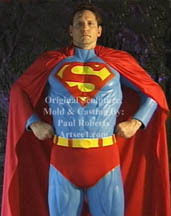 *Suits are available in most superhero colors subject to 50.00 surcharge. Lighter colors may darken with age and are not recommended. *Price does not include customizing or tailoring for your specific body shape. 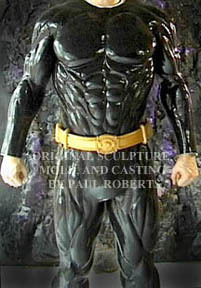 Bottom Line: EVEN THOUGH THIS SUIT HAS THE ABOVE LISTED LIMITATIONS, IT IS NOW POSSIBLE TO LOOK LIKE AN AWESOME FULL BODIED MUSCULAR SUPERHERO BY PURCHASING ONE SIMPLE ITEM and adding your own customizing. Purchaser agrees to all terms, accepts all risks, and agrees to not hold the maker liable for anything but providing the item. These Are Some Sketches Suggesting Ideas For Things That Can Be Done By You With Your Suit Customizing. These Comps Were Submitted By Mr. Bats. I Welcome All Other Input. These photos represent near perfect results. 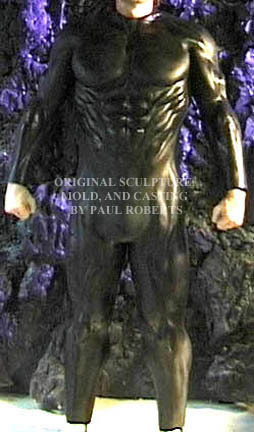 Imperfect suits have minor flaws and no additional paint coats over the surface to cover up any duress wrinkles from form removal from inner form. Each Full Suit Is Created By Hand To Exacting Standards but also takes on a life of its own.